The seasons have changed and today is the first official day of winter! No discussion of the winter season is complete without talking about the dreaded f-word (no, not that f-word!) I’m talking about the flu. The nasty virus that zaps your energy and gives you body aches, chills, cough, fever, sore throat, runny nose, congestion, and a general sense of feeling awful. According to the Centers for Disease Control and Prevention, flu activity really peaks between December and February. But why? 1. People spend more time indoors with the windows shut, so they’re more likely to breathe in the respiratory droplets of a person infected with the flu. 2. There is less sunlight in the winter, which causes us to have lower levels of vitamin D and melatonin. Deficiencies of vitamin D and melatonin reduce our immune response, which then reduces our ability to fight viruses. 3. The flu virus survives better in cold, dry climates, which means it can hang around longer to infect more people. Of all of these theories, #3 has become the most accepted and has science to support it. If you love science like I do, and you’re interested in the exact mechanisms behind why the flu virus survives better in cold, dry air than it does in warm, humid air, then check out this article. Okay – so we’ve already established that flu season is coming. How can you protect yourself? As a naturopathic doctor, I am a huge fan of herbal medicine. Herbs can be used to support our health in so many ways, including helping us prevent and recover from viral infections. 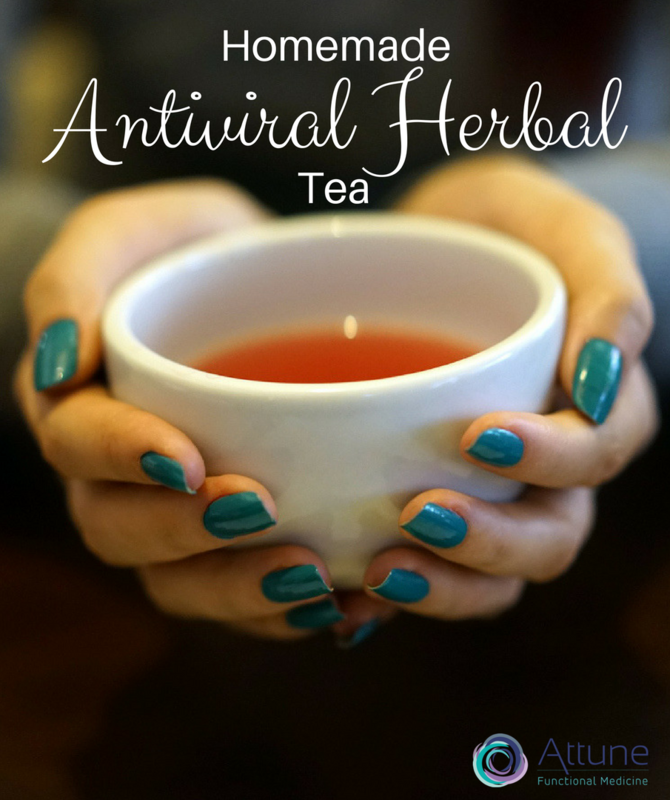 Today I’m sharing my recipe for homemade herbal antiviral tea. This tea is delicious and easy to make with regular ingredients from the grocery store. The flavor is strong because tea needs to be quite potent in order to truly have a medicinal effect. A fair warning: if you don’t like the spicy taste of ginger, then this tea is not for you! Let’s take a look at our botanical superstars, shall we? 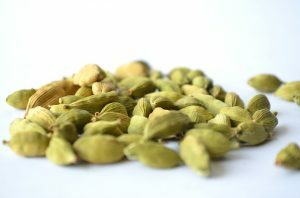 Cardamom: The seeds of these little green pods contain a compound called 1,8-cineole, which is antiseptic (anti-infective) and expectorant (helps to break up and expel mucus from the respiratory tract). Clove: Clove buds contain eugeniin, which fights viruses by blocking the bug’s ability to replicate. 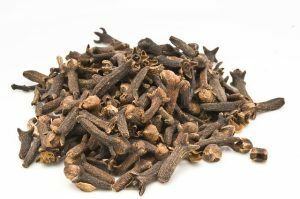 Clove also contains eugenol, which has demonstrated antiviral effects against foodborne viruses. Maintain adequate levels of vitamins A, C, D3 with K2 and zinc through food or supplements. **Don’t take vitamin A supplements without consulting your healthcare provider! Don’t pick your nose, rub your eyes or put your hands in your mouth unless your hands have just been thoroughly washed. The nose, eyes and mouth are entry points for infections. Get at least 8 hours of sleep every night. Sleep deprivation causes immune system suppression and a lot of other bad things, too. Don’t stress out! Emotional stress suppresses your immune system. Try deep relaxation breathing, gentle yoga or meditation. Cut refined sugar out of your diet because it suppresses your immune response. Take probiotics or eat cultured foods like kimchee and sauerkraut to help stimulate your immune system. Okay – without further ado, here’s the tea recipe! Add the 4 cups of water to a medium pot and bring to a boil. Add the cinnamon sticks, cardamom seeds and cloves. Reduce the heat to keep the tea at a gentle simmer. Cover the pot and continue to let the tea simmer for 45 minutes. When the tea has finished simmering for 45 minutes, strain it through a fine mesh trainer or sieve into a clean bowl. Measure out 8 ounces of the tea into a large mug. Add 2 ounces of the ginger juice to the hot tea and stir. Pro Tip: To make this tea even more effective and tasty, add the juice of a lemon or lime for vitamin C, plus 1-2 teaspoons of manuka honey (I recommend this brand) to each cup for extra antiviral and immune-boosting power! Drink 2-6 cups daily. This tea will help to break up mucus, soothe your sore throat, and reduce the spread of the virus in the body. 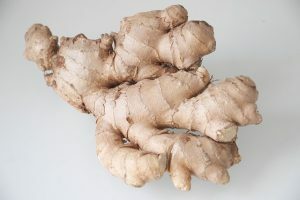 Leftover tea can be refrigerated and reheated on the stovetop as needed, but the ginger juice should be consumed within one day to maintain its effectiveness. Bharat Aggarwal and Ajaikumar Kunnumakkara (2009). 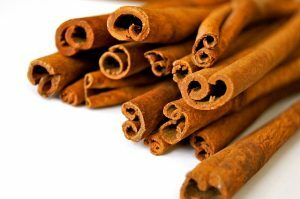 Molecular Targets and Therapeutic Uses of Spices: Modern Uses for Ancient Medicine. World Scientific Publishing Co.: Singapore. Stephen Buhner (2013). Herbal Antivirals: Natural Remedies for Emerging and Resistant Viral Infections. Story Publishing: Massachusetts.